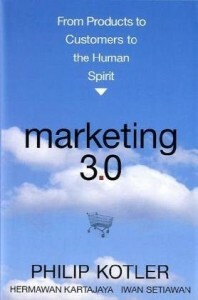 One of the most interesting business books that I’ve read is Marketing 3.0 by Philip Kotler. This book discusses how the model for successful companies has changed over the decades. Originally the most successful companies were product-focused, those that created the best products. However, around the middle of the 20th-century, the model changed so that the most successful companies were customer-focused, providing great service, meeting the customers’ particular needs, the “customer is always right.” Now, at the dawn of the 21st-century, the world of the Web and social media, customers most want a company whose values and personal identity appeal to them. Of course good products and good customer service will always be important to a company’s success, but the spread of the Internet has resulted in us becoming much more aware, much more connected with companies’ identities and the identities of the people behind them. We can read a company’s values on their website, follow their CEO on Twitter and Facebook. Suddenly it’s not just their services but they themselves who matter to us. We want to know their values, their spirit. Are the people the sort who would interest us? The sort we can like? Respect? As a content and marketing writer, I’m very aware that it’s no longer enough to just market your products; you need to also market yourself. You need to tell your story and tell it well. Tell a story that engages someone and you build-up their interest in you and what you offer. They learn of your devotion and knowledge, what makes you stand out from others in your field. Through your story, your audience discovers who you are, what you’ve experienced, and so they come to trust you and what you have to offer. I help professionals explore their story and then I help them figure out how to best use it to engage their target audience. I’ve told my clients’ stories in numerous mediums: text, comics, video, animation… whatever suited the tale the best. How should your story be told? This entry was posted in Marketing and tagged content writing, Marketing 3.0, Philip Kotler, story. Bookmark the permalink.